GovTribe does real time acquisition and integration of subcontract award data. The source for this data is USASpending.gov. That is the site to which the federal government is required to report subcontract award data in accordance with the Federal Funding Accountability and Transparency Act (FFATA). There are important differences between the nature and quality of subcontract award data vs. prime contract award data. The driver of these differences is that the federal government is responsible for the timely reporting and accuracy of prime contract award data. However, subcontract awards are self-reported by prime contractors. There is no real oversight, enforcement, or quality control over the subcontract award reporting process. So the completeness, timeliness, and accuracy of subcontract award data depends entirely on how diligent the relevant individuals are from within the bureaucracy of the prime contractor companies. For this reason, meaningful aggregate analysis of subcontract award data is not really possible. That is, you can look at who the top subcontract awardees are in a specific market segment, but you could not be confident that the story told by the data was accurate. The vendor showing the most subcontract award dollars in FY 2018 under DHS, for example, is really just the vendor who subs most often to the prime contractors who reliably report their DHS subcontract awards. Because of these limitations inherent in subcontract award data, GovTribe does not provide a way to search subcontract data in aggregate. However, there are two very useful ways in which subcontract data has been integrated into the site. 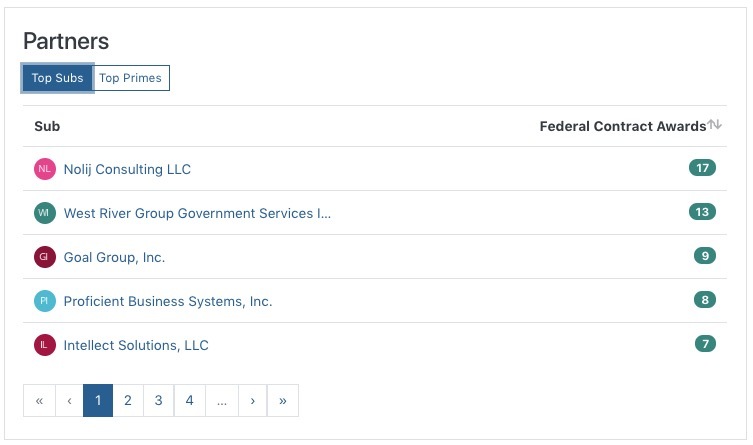 For every Vendor page listed on GovTribe, if that company has ever reported a subcontract award to another company, or has even been the subject of a subcontract award report, we show a list of those partner companies. You can toggle between Top Subs and Top Primes to view a list of the companies that vendor either awards subcontracts to or receives subcontracts from, respectively. Next to each company name is a badge that shows the number of Federal Contract Awards on which the indicated company and that Vendor have partnered. Click on the numbered badge, and you will be taken to the Federal Contract Award page, filtered to that particular prime/sub relationship to view the relevant Awards. You can, of course, from a blank Federal Contract Award search, manually fill out the Awarded Vendor and Sub - Awarded Vendor filters with company names to see if there is any reported history of a sub-prime relationship. However, it would likely be more expedient to search for one of the companies on the Vendor search page and then review the Partners section to see if the second company is listed. The second way we have integrated subcontract award data is to display a list of the subcontract awards that have been reported for every federal contract prime award in our database. If a Federal Contract Award has any reported subcontract awards (i.e. like this one), we include a table titled Sub Contractors in which we list the companies that have received subcontract awards, the number of sub-awards, and the total dollar value of those sub-awards.